I wound over 120 warps this week as prep for weaving with groups and friends and I am not even half way. I put on some music or the tv, make sure I have absolutely every thing I need on hand…scissors, rubber bands, cross sticks and string…and away I go. I have long sticks all over the room wedged between books on the book shelves and I hang the completed warps on those as I go. It’s very efficient. I always wind in the same direction with the balls of yarn in the same place. It has become so automatic and so much about feel that I have reached the point where I can wind two colors and separate them into sheds as I go without even looking to check if I am putting the right color on the right stake. And then I decided to take a break and wind something for our Key Fob Weave-Along that is still buzzing along in the Ravelry Backstrap Weaving Group. 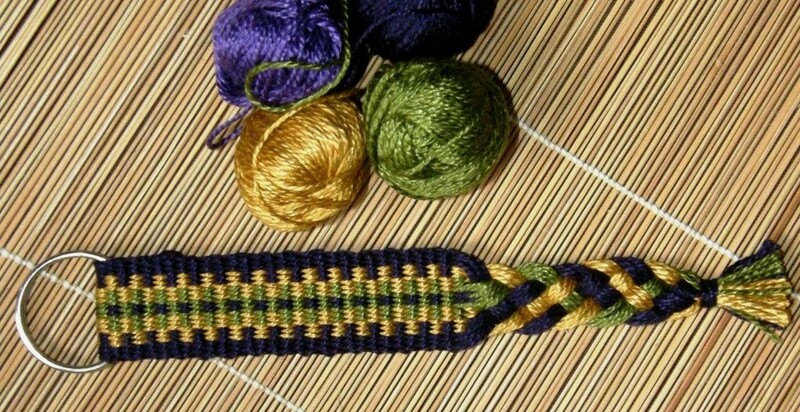 I decided to weave what is often called a ”threaded-in” pattern. 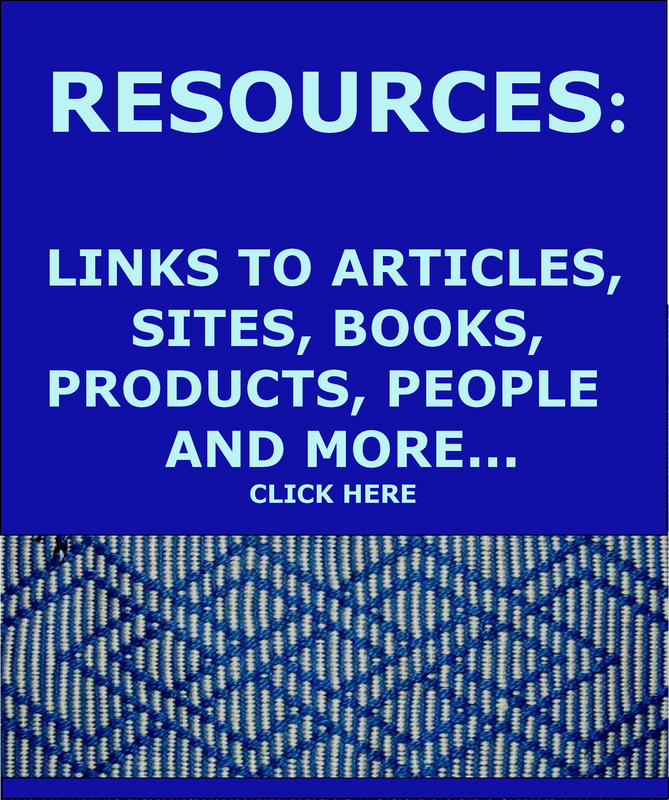 Basically they are stripes, or ”dots” (tiny horizontals or single ends in a contrast color), or horizontal bars, or any combination of the three and can be as simple or as complex as you like. Warping in pairs helps makes the process for beginners a little less daunting. And that is when I was reminded of how it feels when you are first learning to warp…trying to follow the path, handle two threads at once, remember which color goes where and when while trying to tie off ends and maintain tension. You feel like you are all thumbs. I was remined of that beginner feeling because winding some of these kinds of threaded-in patterns from one stake to another and back, as I do for the backstrap loom, can be a little tricky. It is not always as beautifully straightforward as it is when winding them using a circular warp for an inkle loom, for example, where one circuit of the inkle frame gives you a single end. The way I warp, each ”circuit” gives two ends and often four if I am winding doubled threads. Sometimes a half revolution is required, knots have to be tied at the other end of the warp and sometimes it works best if you reverse the winding direction after the halfway point. I am not used to having to stop and actually think about what comes next…about how to avoid spaces between the colored horizontal bars in each column, about which of the two central posts each color is supposed to pass around and how to make sure the pattern is balanced. I didn’t like having to get out paper and colored pencils when I got confused! I tell you, old habits and muscle memory are hard to break. 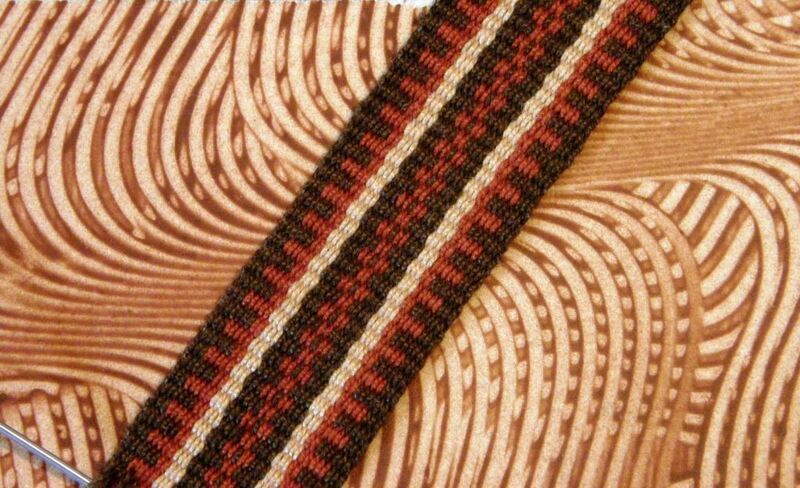 The idea of a threaded-in pattern is that it is created by the way you set up the warp and separate colors into the two sheds. 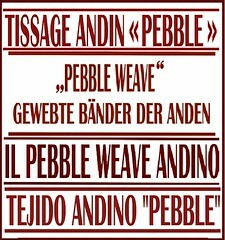 Once that is done, all you have to do is weave it off in warp-faced plain weave…no pick-up or other manipulations are needed and the weaving moves along so quickly! So, if you are interested, here are the warping instructions for the fob at left. 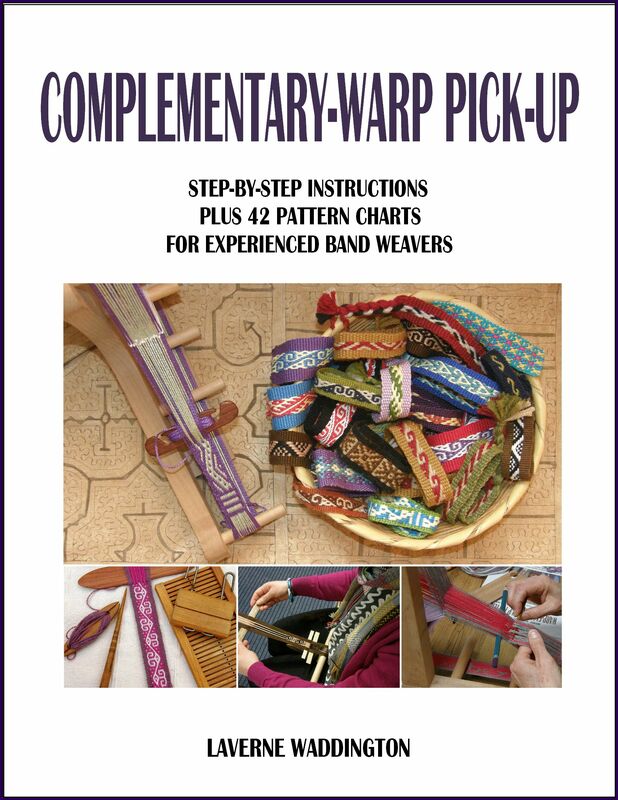 These instructions are for those who are already familiar with winding warps on four stakes/posts and separating colors into their sheds as they go…. I am calling the Start and End post ‘A’, the two posts in the middle ‘B’ and ‘C’ and the post at the other end ‘D’. 1 1/2 revs yellow and green together (green on C, yellow on B) you will stop at post D, cut the green and tie purple to the green end. 1 1/2 revs purple and yellow together starting at post D (yellow on C, purple on B) you finish at post A. 2 1/2 revs of purple finishing on post D. You need to tie the purple off to something. I tie it to the green and purple ends. 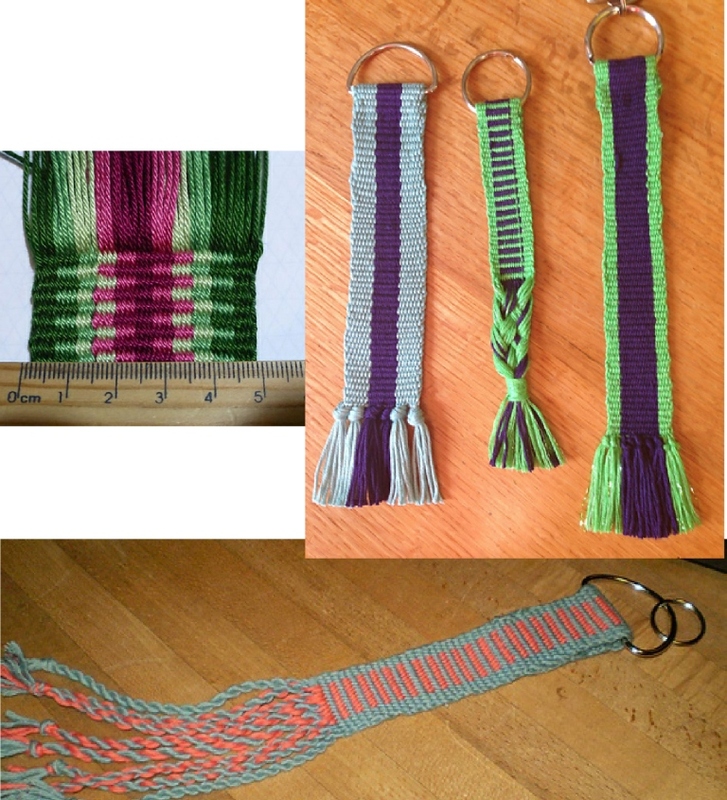 I like to untie the knot in the green and purple and then tie all three ends off together. The only other key fob I wove this week required nice straightforward warping. I was inspired by Joyful’s use of a button on one of hers. 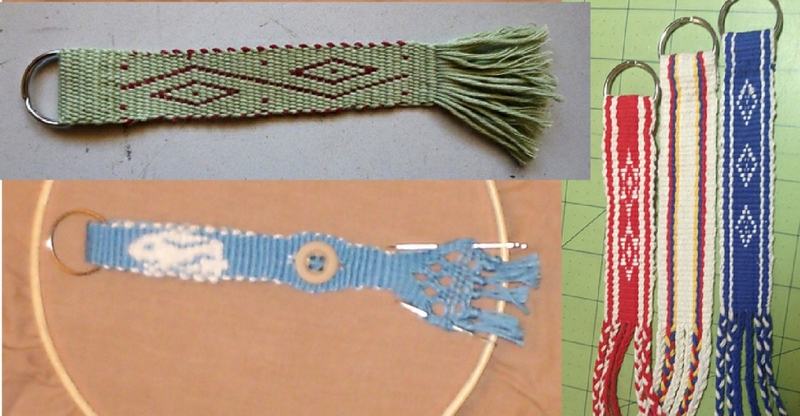 Instead of sewing the folded woven band to itself to secure the ring, she created a slit, ot buttonhole, while weaving and used a button to make the connection. 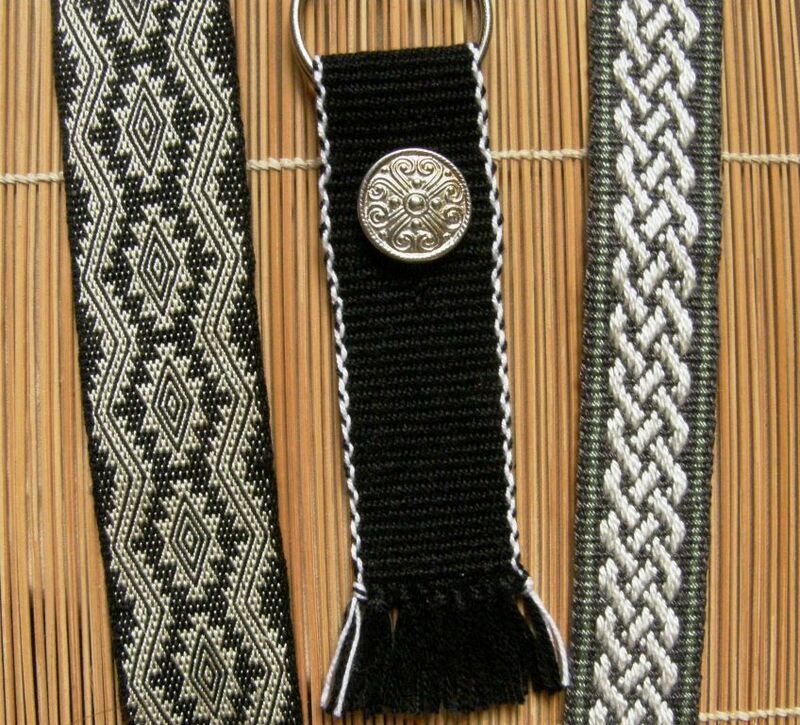 I wove a black plain-weave fob for my silver-color button. The other small project I have been working on is a silk bookmark. It was originally planned as a keyfob for the WAL but I was enjoying weaving it so much and didn’t want to stop at key fob length. 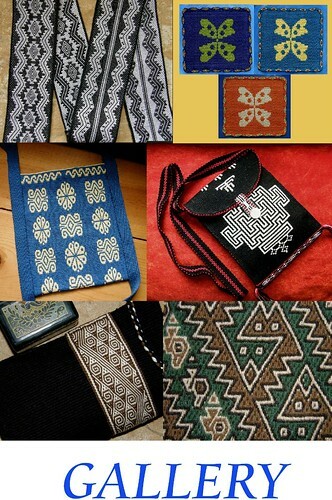 It is 60/2 silk and has a traditional motif of the Isoseño Guaraní people of lowland Bolivia. Many thanks to the people who commented last week with ways to make one’s hands silk-friendly. 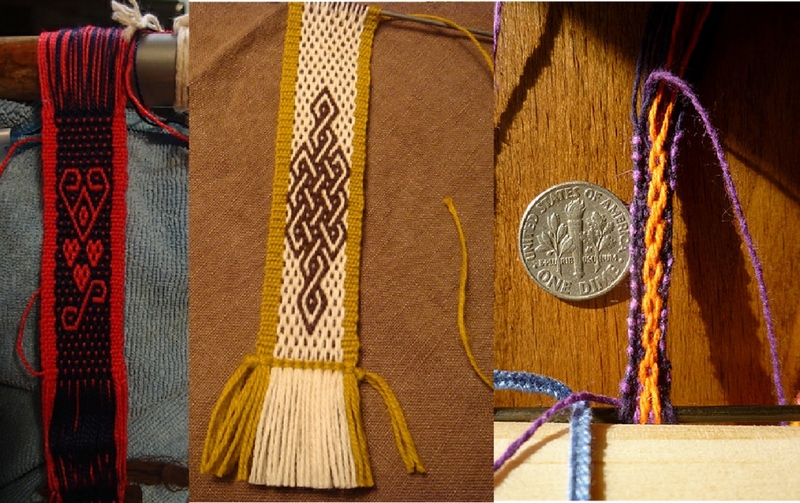 The piece on the right is a supplementary-warp band that I made ages ago in tencel which needs to be finished and used as a fob or bookmark. Terri, who very recently joined the WAL, showed us that simply knotting the warp ends is a very neat and time-efficient way to finish a band and this is how I finished the black fob rather than try a new braid. 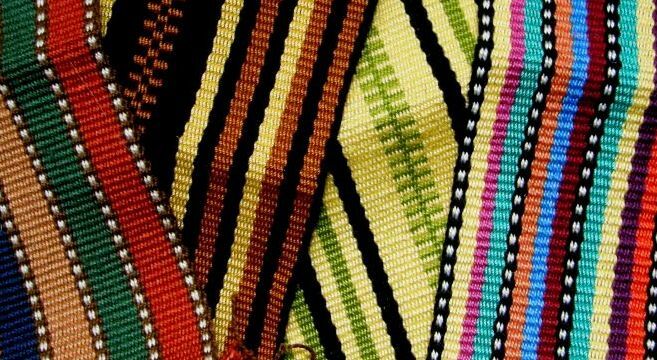 Her are three fobs made by three weavers using three different structures. 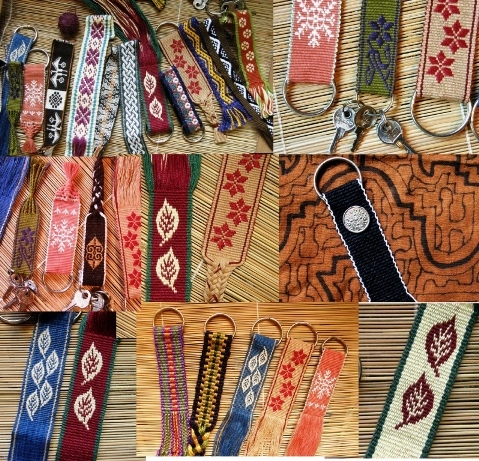 Eska’s fob on the left uses the simple warp-float technique floating two colors to create a motif found in yurt bands and other Central Asian textiles. 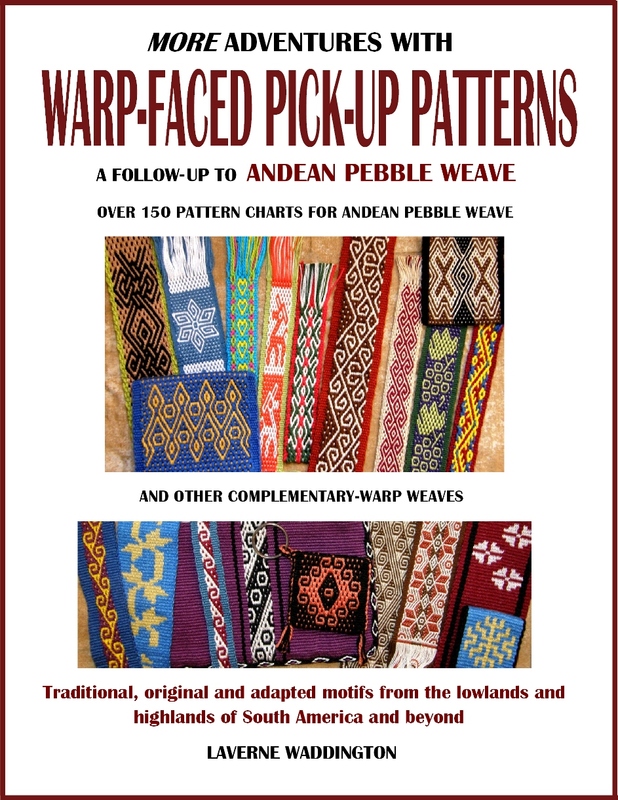 Ilze’s name band is woven in the supplementary-warp structure and Julia’s is in Andean Pebble Weave using a motif that I adapted from Central Asian weavings and which is charted in my second book. Wendy, Terry and woolfancy were all on the same wave length color-wise and designed with stripes, combs and bars. That D ring with the added split ring makes so much sense for wide bands that won’t sit well on the curve of a regular ring. 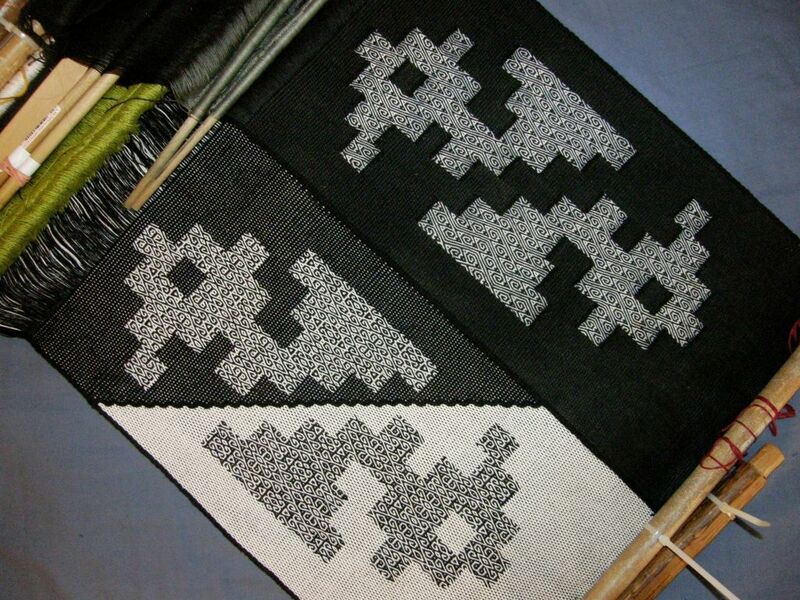 Valtricot continues her studies in patterning with supplementary weft. 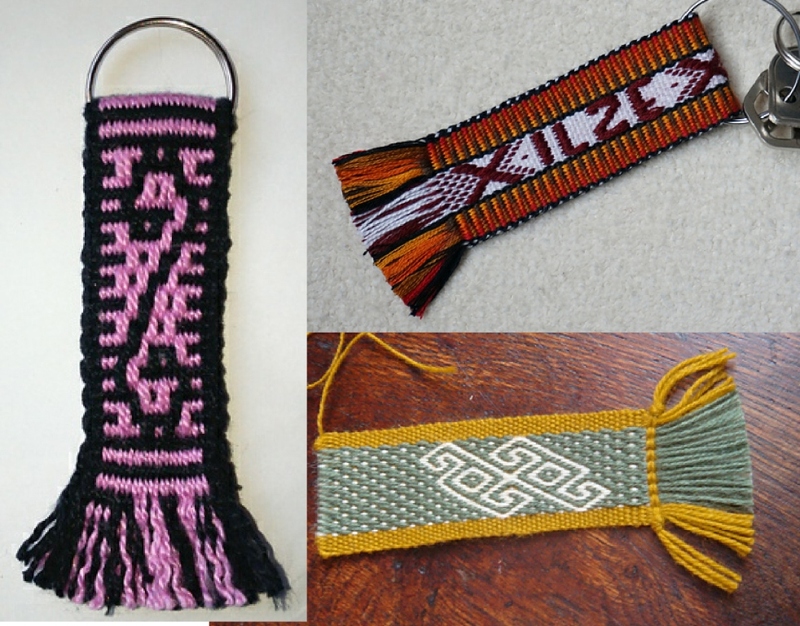 Celticthreads made three fobs, two of which also have supplementary-weft motifs.I love the white plain-weave one with its colorful stripes and braids. Joyful, wove a rabbit figure in angora supplementary-weft. You can also see her use of a button as well as sprang in the unwoven warp-ends. Julia T wove a Valentine’s Day themed fob while Julia W wove one of the knotwork patterns from my second book. Sarah’s completion of her first Andean Pebble Weave band and Lesson One in my first book shows that she is well on her way to starting her first patterns. So, it is back to the warping board for me and the workshop prep. I have decided that I must finish this task before settling back into my big bird project. While I wind my dozens of warps, my mind is on to the next big project and then the next and the next and I am thrilled to say that, thanks to something inspiring that showed up on my Facebook newsfeed recently, I have found the curvy shaped motif that I want to create in the ikat technique and then fill in with pick-up patterns. I can’t wait to work on it! That has been the whole idea behind my recent ikat bird experiments. I want the ability to create curves and irregular shapes and fill them with pick-up patterns. I stand at the warping board and dream about that, plan out the steps and think about the wonderful opportunity that has recently come my way to study with an ikat artist while I am in the US this spring. Buzzing is definitely the word for the Ravelry Backstrap WAL! I love that I can visit the forum twice a day and see new comments and work. Thanks for keeping us all connected and inspiring each other, Laverne! 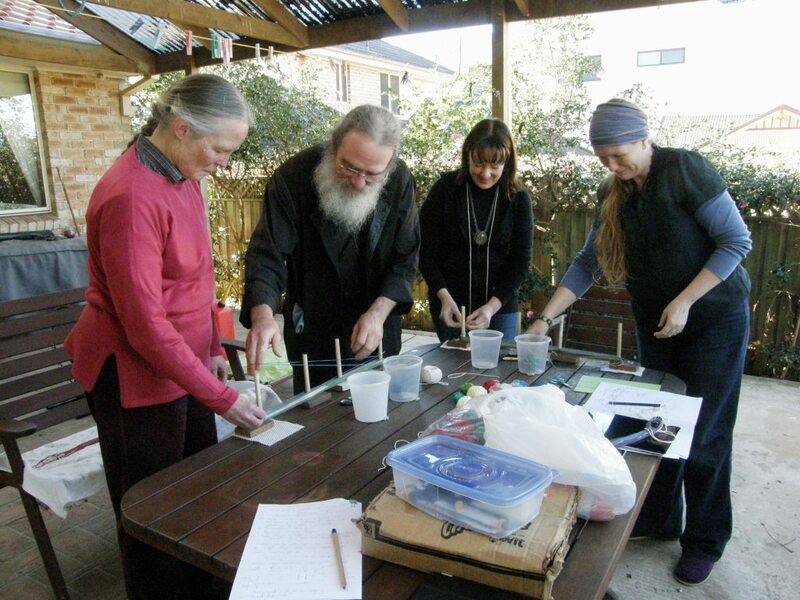 Thanks for taking part with so much enthusiasm, Wendy, sharing your pictures and helping out. Laverne, lastima que estás tan lejos! Con gusto iría a ayudarte!